Belgium Camogie is going strong after our two tournaments this year – The Hague in April and Copenhagen in May. Despite a long two-month gap in tournaments, we managed to keep our numbers for training, and the momentum carried on thanks to a great blitz in June. Playing camogie with Belgium is a very interesting and rewarding experience, with training sessions made up of young and less-young, Irish and non-Irish (Serbian, Colombian, Spanish, Belgian & French this year), as well as Irish girls who hadn’t picked up a hurley until they got to Brussels! It’s not easy to keep players motivated and interested with long breaks between matches, and a lack of teams to play. This season was a tough one for other clubs who had difficulty fielding teams. Thankfully, Holland are always strong opposition and competitive players, so both clubs got a lot out of the tournaments. Our season got off to a great start in April, when 14 of us made our way to The Hague to put into practice everything we’d been focusing on in training. We played Holland twice in 11-a-side thirty-minute games, winning both to bring home the trophy. Next up was Copenhagen on 30th May, hosted by Viking Gaels. 11 Belgium players made the trip, and faced strong opposition from a competitive group from Holland. We got off to a slow start, losing the first game by two points. It took some motivating words from for us to get going, and we bounced back to beat Holland in the second match. With everything left to play for after one win each, Belgium won the final by a goal. Our Camogie blitz in June was a great morning in VUB, with a draw between the over- and under- 30s, and wins for the Rest of the World team vs Munster/Connaught and Blondes vs Brunettes. We’re looking forward to our home tournament at the end of the month, and hopefully welcoming a few teams to Brussels for the weekend. If past tournaments are an indication, this one will be a resounding success! Following three extremely competitive tournaments with three different winners, we’ve reached the business end of the European Hurling Championship and the Belgium hurlers are looking to lift the cup for the third time in a row. The Brussels tournament, which will be held in Kituro Rugby Club in Scharbeek looks set to be the most competitive tournament of the year with several strong teams expected to participate. Belgium’s season has had its highs and lows so far. The European Champions began training in February to prepare for two warm-up games, firstly against the Civil Service Hurling Club, and then against Realt Dearg of Terenure. A rusty Belgium put on a good showing in both games, narrowly losing out to a good Civil Service side, but getting the aggregate win against Realt Dearg following a superb performance in the second of two ‘legs’. As the Championship got underway in April, Belgium would quickly learn that retaining their title would be a tougher challenge than in years gone by. Den Haag took the first tournament with an impressive win over a strong Amsterdam side that had beforehand put Belgium out in the semi-finals; the first final Belgium had failed to reach in over 2 years. The Copenhagen tournament was another disappointing day for Belgium as failure to capitalise on chances in difficult conditions resulted in a draw against Zurich that they would live to regret as hosts Viking Gaels powered home to resounding victories over Belgium and then Zurich to secure the win. 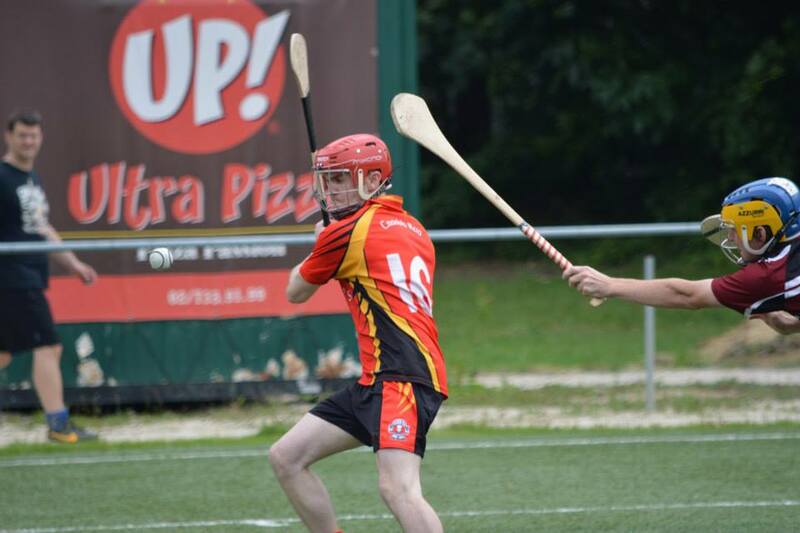 Belgium were finally victorious at the third time of asking in the 2015 Championship with a win over Viking Gaels in the final of the fantastically-run Dresden tournament. The Dresden win was crucial as the Belgium side now go into their home tournament with their fate in their own hands; a win will secure a third Championship in a row. The scene is set and Brussels ready for yet another great day of hurling. Belgium are close to being able to field 2 teams on the 25th – a sign that hurling is alive and well in the capital. Be sure to come down, have a beer and support your local team as they seek to be crowned Champions of Europe once more.